Google could be tracking and recording your every location on your Android device, and you may not even know it! 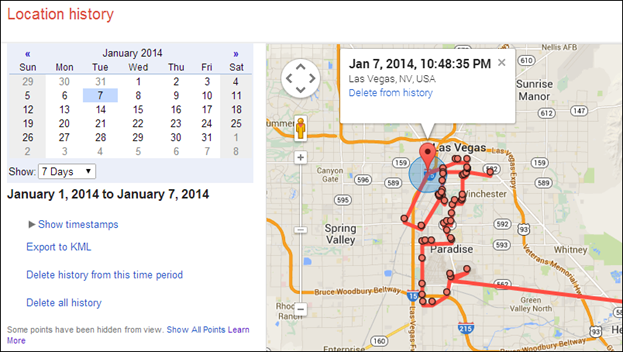 The culprit is a largely ignored feature in Android called Google Location history. The actual location service isn’t unusual. It uses information like Cell IDs and Wi-Fi routers to locate and place your device. Other companies such as Apple and Microsoft use similar services for their devices. The existence of Google’s Location history is nothing new, in fact other sources have reported it previously, but it’s still surprising how few people know or realize what it is and how it works. What isn’t surprising are the reactions to it, which usually range from “creepy” to “scary” and a few others between. The thing about the Google Location service is that while the standard Android setup routine asks you if you want to enable it, it doesn’t inform you of the Location history option, let alone any way to opt-out of it. 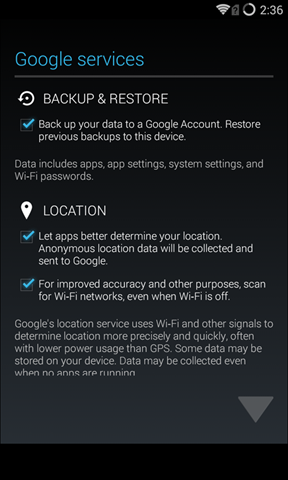 To be clear, the Location service is useful, and unless you’re extremely privacy sensitive, you should enable it. 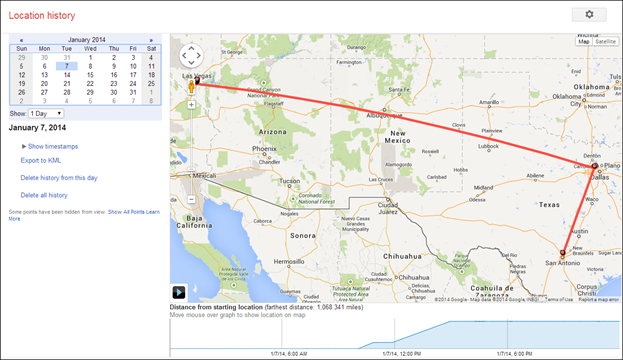 Unfortunately, Google Location history is another matter altogether. Here’s what it entails, how to disable and delete it, as well as a few ideas as to how Google can better implement it into Android. Here’s the scenario: you finally take the plunge and buy yourself that shiny new Android phone, which is wonderful. It’s sleek and fast, and you just can’t wait to use it, but there’s a few things you have to do when setting it up before you can finally get to your home screen. GPS helps provide your device with a precise location so you can use it for stuff like routing and turn-by-turn navigation. But, it consumes a ton of battery life. The only time you ever really want to have GPS running on your mobile device is when you need it. The Location service circumvents this problem by using signals that your device is usually using in the first place. It hones in on cell sites and Wi-Fi signals to locate your device, often very accurately. If you check out the second Location option on the setup screen, you see that it can even scan Wi-Fi signals when Wi-Fi is off, and it can do this with a minimal hit to your battery. The problem though are the words “anonymous” and “collected.” As you will see, it is not really anonymous because it is tied to your account, and that it is collected, means that your movements are being recorded. To illustrate how your location data is being collected, and why you might want to be concerned, let’s look at an example. 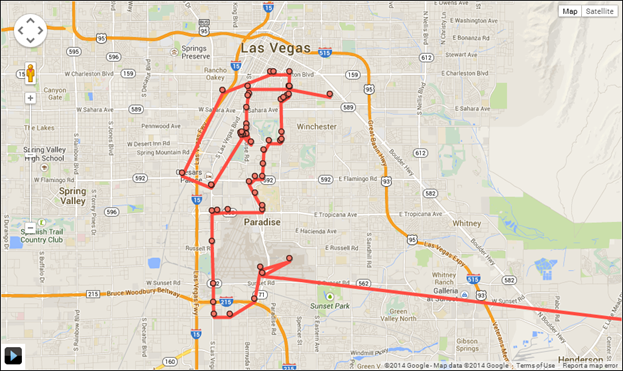 The following map is from our own Google Location history on January 7, 2014 when How-To Geek visited Las Vegas for the Consumer Electronics Show. You see we departed from San Antonio bright and early, with a quick stop in Dallas just before noon, as indicated on the timeline below the map. The timeline peaks when we arrive in Las Vegas. If you click on the timeline, it will show you where you were and when you were there. In this case, we arrived in Vegas (or turned off airplane mode) at 2:58 PM. If you zoom in just like you’d do normally on any Google Map, you can see all the various places we traveled that day. Each point on the map represents where Google used Wi-Fi Positioning System (WPS) to locate this device. Each time the phone was within range of a Wi-Fi access point, it would send its MAC address and SSID to Google’s servers. Using GPS (when available) and cell ID data, it can locate where that Wi-Fi access point is, which is then collected and stored to create the history you see on the map. It’s easy to be alarmed, but there’s absolutely nothing new about this. All of these, and the many more apps and services that have resulted from WPS are awesome and can yield some extremely useful results. For example, your phone can know when you’re at the airport, it knows from the confirmation e-mail the airline sent you that you’re leaving on x date at y time, and it can then automatically display your boarding pass so you don’t have to keep track of a paper one. We can also see the use of maintaining a history. Let’s say you live in the suburbs and you commute to and from work at approximately the same time each day. Location history can interpret your movements and display pertinent information such as weather and traffic information so you have travel conditions in your hand before you hit the road. Yeah, But What if You Don’t Want All That History? Like we said, we’re hardly the first to report on this and yet, it’s surprising just how few people know that their location history is so easily available and so much about your comings and goings can be gleaned from it. This location history is troubling not because it exists, but because users seemingly have almost no control over it. You cannot, for example, limit how long location data is retained, and it doesn’t expire automatically. Moreover, you can’t delete data from any point going backward. You can delete history for any period (from one to thirty days), or you can delete it all, but you cannot specify that you only retain history from the past day, week, or month. Perhaps, the worst part is that it’s really easy to exploit for evil purposes. If you’re using an Android device, the Location services settings are easy enough to attend to, once you know where they are located and what they mean to you. You want to first open the Location settings as shown in the screenshot below. If you want, you can simply turn off the Location settings and you’re done, at least with regard to anything on your device reporting your location. However, if you want certain apps to still be able to pinpoint your location, you can’t do that. 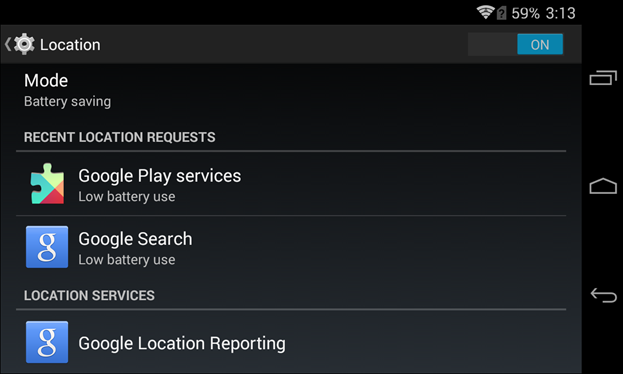 Luckily, the more nuanced approach is to tap “Google location reporting” for its settings. 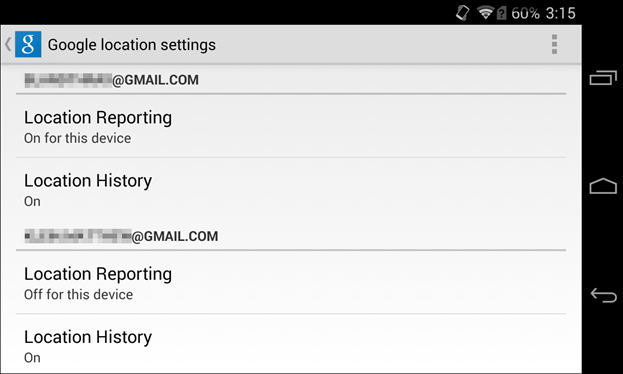 First, you have the option to turn off Location Reporting completely. This will stop reporting location data to Google’s servers and render Location History a moot point, almost. Alternatively, you can leave location reporting enabled (recommended) and turn off Location History (preferred). If you’re using an Apple iOS device such as an iPhone, then you can turn off Google’s Location Reporting, but you cannot wipe your history from the device. You’ll have to do so from the Google Map location history page we discussed earlier. Even if you’re not using an iPhone, you may have multiple Android devices, which could all be recording a history. Remember, you can wipe all your history, a certain period, a single day, or you can delete single individual point on the map. Attending to your Location history, regardless of the device you use, is pretty important and should be a wildly flapping red flag alerting you to just how important good account passwords and device security (locking it) really are. In any event, you owe it to yourself to scrutinize your history and get to know its features and options. The problem with the Google Location history isn’t that it exists because, to be honest, it’s kind of neat to be able to look back on your day-to-day meanderings. Further, it’s useful. Parents can use it to keep tabs on their kids, and you can track your work mileage in case you forget to check the odometer, or retrace your steps from your vacation to New York or DC. The point is that there’s no clear indication by Google when you set up your device that it’s compiling all this history, and it doesn’t let you specifically opt-out of it, so users who don’t know otherwise are potentially storing a lot of personally (read: not exactly anonymous) sensitive data with Google. To that end, perhaps Google should provide more transparency during setup such as adding an option to disable Location history, or simply a disclaimer informing the user as to its existence. It’s also troubling that Location history is specific to an account versus device, or at least the device’s primary account, i.e. the one you used to set it up. The ramifications are that anyone with access to your device can add another account, turn off syncing and other apparent indications of that account, and quietly track your device from any computer with Internet access. It would a great deal more reassuring if Google would add an extra layer of security, such as an admin password or PIN, when setting up a new account, or at the very least to manipulate Location settings. Sadly, until such a time that Location history is better advertised (more obvious) and harder to enable, it is liable to continue to elicit reactions such as “creepy” and “scary” whether deserved or not.